The Okinawa Churaumi Aquarium is colorful, busy, and hands down one of the most impressive aquariums we’ve visited. With its dark cool hallways it is a beautiful place to burn energy on a hot, humid, summer day. Okinawa was very hot in June, like step outside, take a deep breath, and find your happy place hot. 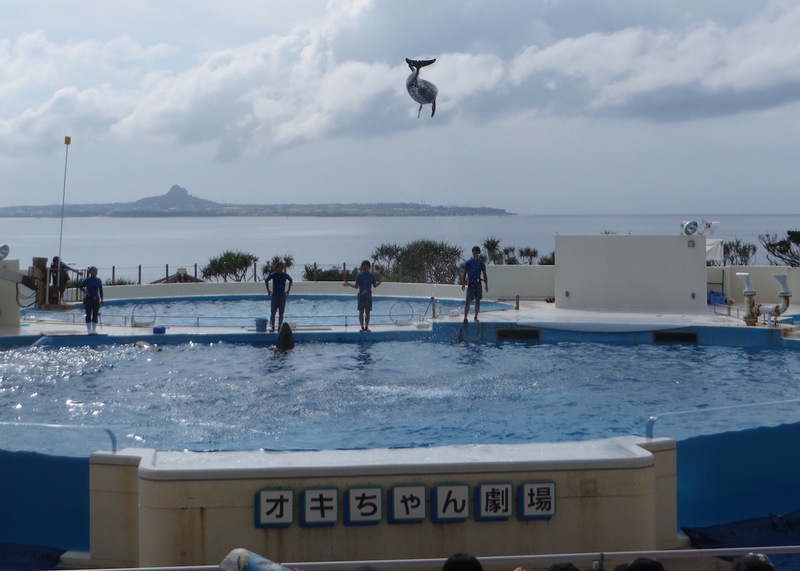 We started with the outdoor dolphin show and I tried my hardest to enjoy it despite how much it made me think of “The Cove.” Clearly these dolphins weren’t being slaughtered but we were in Japan and I highly doubt they volunteered for this opportunity. Believe me, I try to enjoy animal experiences without constantly questioning the intentions of the people behind them, but I am an animal lover and questioning everything is what I do. 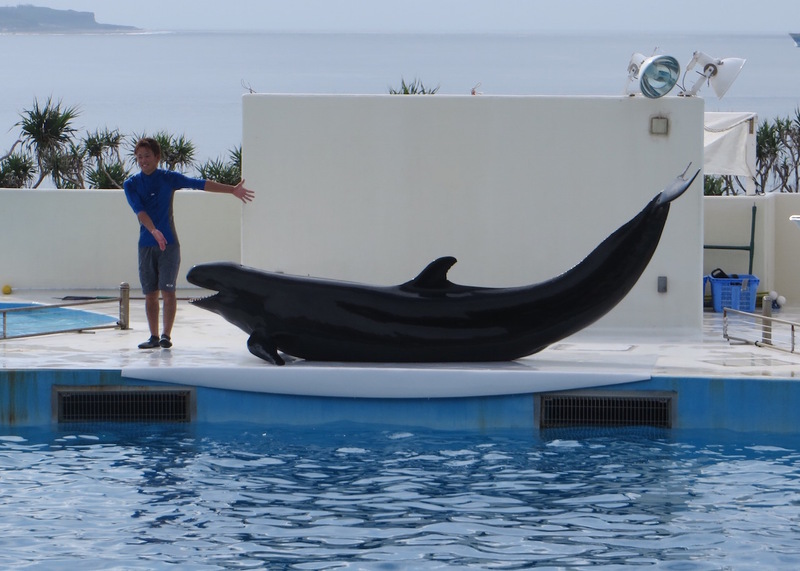 When the mental pendulum swung away from dolphin kidnapping, I was extremely impressed with the abilities of these animals. It was a dazzling show. We are so lucky to share a planet with such extraordinary creatures. If you are visiting in the summer, get there early and find a seat in the shade. Enduring the show in the sun made me empathize with a nearby popsicle. I wondered if when I stood up, my skin would fall to the ground in a slimy, sticky, puddle. 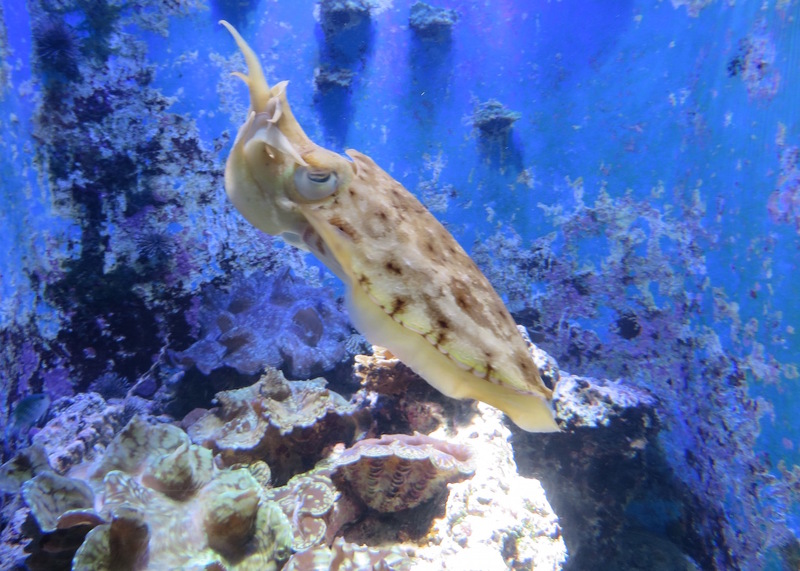 The Okinawa Churaumi Aquarium is the third largest Aquarium in the world. The largest tank is a heart-stopping site and is home to Whale Sharks, Manta Rays and hundreds of other fish. It is 10 meters (33 feet) tall and 27 metres (89 ft) wide. I have never seen anything like it. On the day we visited, they had at least 3 whale sharks in the tank and we had the special opportunity to watch them feed. I am not sure what is more impressive, the tank, the whale sharks, or my questions about how they got the whale sharks in the tank. While I mostly loved our visit, there were a few things I didn’t like. The signs in English weren’t nearly as educational as displays in other aquariums and zoos of this caliber. I asked a friend if the signs in Japanese were more educational and he said they weren’t. There was no information on ocean pollution, no signs encouraging conservation, or any details on the impact of overfishing (or dolphin killing!). For an aquarium that has welcomed over 20 million visitors, I don’t understand why they aren’t more passionate about educating their guests. Seeing a whale shark up close is a breathtaking sight but the ocean is where these creatures belong. Despite the size of the tank, which is crazy huge, it’s hard to see such an enormous animal swimming in a confined space. 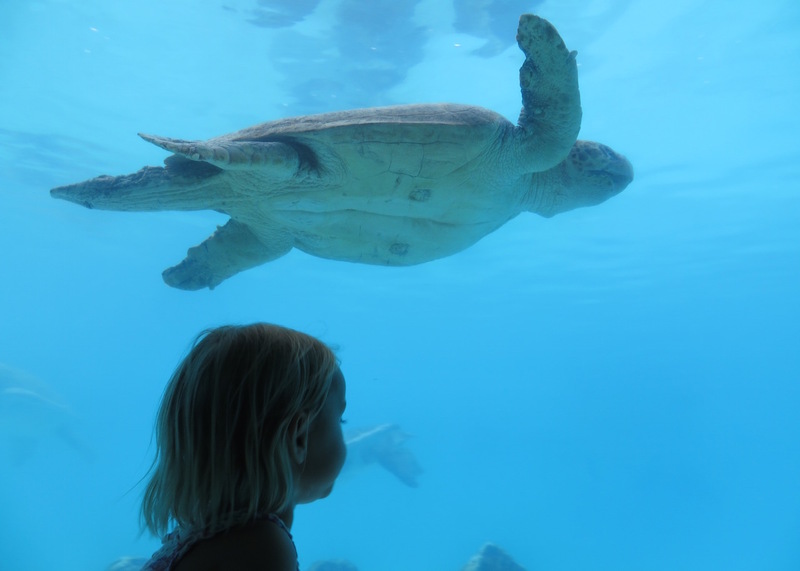 Despite these points, the aquarium is absolutely worth a visit. 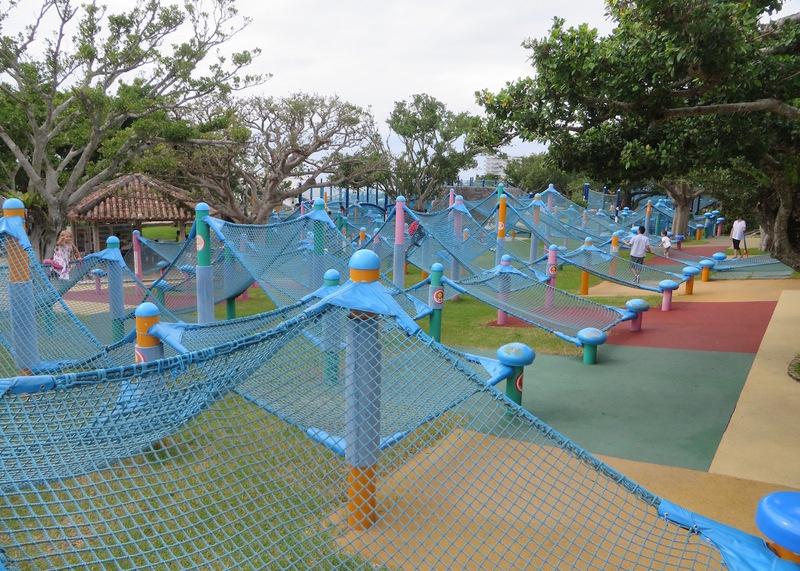 There is also an awesome outdoor climbing an play area for kids so making this a full day will be easy. On the way back to your hotel, make sure you stop at Cafe Captain Kangaroos Hamburger Island. You may not associate Okinawa with Hamburgers but when you are tired of raw fish, this place is a must. It’s a hole-in-the-wall which makes it easy to miss so pay close attention to google maps. This entry was posted in Asia, Japan and tagged Cafe Captain Kangaroos Hamburger Island, Churaumi Aquarium, hamburgers, Nago, Okinawa, Whale Sharks. Bookmark the permalink.